you are what you love. 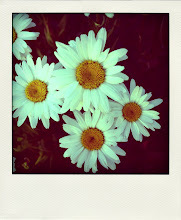 . .: homage to polaroids. i got a polaroid camera when i was about 7 and took pictures of everything! loved it. i found this same love again last year but was devastated to learn of the discontinuance of the film. why? as a replacement for polaroids i now want a holga. they're wicked cool.for a preview click here. I LOVED polaroids! I remember taking pictures with those. I still have some. Good luck with the holga . . .